Infographic: Are You A City Slicker, Or A Suburbanite In Disguise? 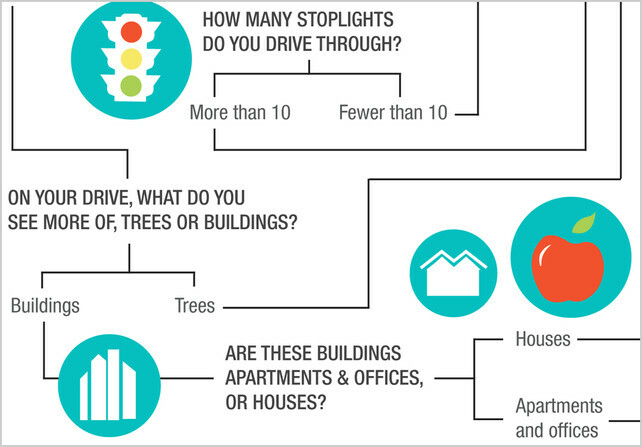 An NPR-designed decision tree makes an educated guess about whether or not you live in a city. We’re living in the early years of what many call the “Urban Century.” Cities aren’t just growing, they’re transforming–at unprecedented speeds and scales. A new series from National Public Radio, The NPR Cities Project, aims to examine what urbanism means today, through long-form pieces and data visualizations. NPR’s newest infographic, Do You Live In A City? caught my eye last week. The decision-tree style image leads you through a series of mundane binary inquiries, finally spitting you out at one of six possible answers, ranging from “Definitely Yes” to “Definitely No.” Obvious factors, like transportation mode and housing type, are joined by more inexplicable ones, like how long it takes you to get to Starbucks and whether or not you go to work before dawn. Designers Nelson Hsu, Natalie Jones, Melanie Taube, and Tanya Ballard Brown open with a little disclaimer: “this chart may (or may not) show you if you’re really an urbanite.” The “or maybe not” speaks volumes. To the ire of many NPR commenters, the chart is often wrong. But that may be the point: Cities are in-flux like never before, and typical markers associated with urbanism, like population density and commercial infrastructure, no longer apply. For example, I’m a Brooklynite who lives 20 minutes away from the nearest Starbucks. Do I live in a city? “Maybe.” One commenter, who reverse-commutes from downtown Boston to work in the suburbs, points out that the chart says she definitely doesn’t live in a city. Another points out that there are more types of public transportation than buses and trains. The Starbucks questions seems to cause the most trouble. If you don’t have a Starbucks, says the chart, you definitely don’t live in a city. If the nearest is a short drive away, you might. If you can walk to one, Probably Not. If you can walk to two or more, Maybe. Confused? “Double barreled questions, non-exclusive choices, ambiguous paths, suspect definitions” abound, comments ChicagoSouth. The big generalization we hear over and over–the world is urbanizing!–is a simplistic picture of a complex reality. In truth, the days of “town and country” disappeared decades ago. Today, we deal in dozens of shades of urbanism, ranging from the edge cities and periurbanism to urban agrarianism.